It’s no more than a few minutes into Ocean’s 8 when the camera draws our glance to a boldface “2018” engraved on the face of a tombstone. 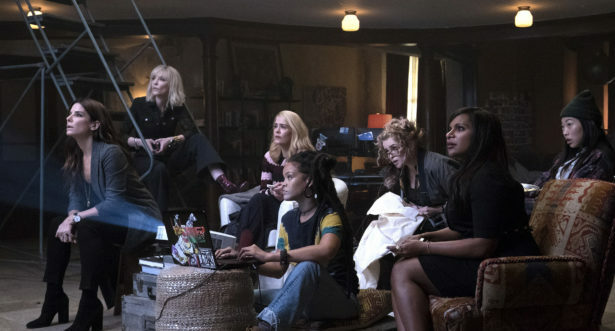 We could think up one or two narratively inclined motivations for capping the lifespan of the crypt’s inhabitant in the current year, but Ocean’s 8 is quick to prove that narrative is low on its list of priorities. Instead, the film’s deceptively innocuous crawl past the marble inscription feels like quite the deliberate reminder of when the story of Debbie Ocean and her gang of thieves takes place: After Ocean’s Eleven. After Ocean’s Twelve and Thirteen. After all that has come since. After a time befitting of stories like these. Perhaps after story altogether. If the rejection of not only story, but of its proverbial backbone, sense, are part and parcel of the demands of 2018, Ocean’s 8 is ready and willing to fall in step. What’s amazing is the cunning and dexterity with which the film executes the filling of these gaps, a long con worthy of its family crest. In lieu of the tired notion of narrative, we’re slipped a duplicate emblazoned from head to toe in beauty, rhythm, chutzpah, and beyond; when it hits the eye, Ocean’s 8 is less an overarching story than a collection of small but satisfying sensory explosions. The pleasure is not simply in watching Sandra Bullock’s Debbie and her can of assorted nuts pull off leg after leg of their especially elaborate, refreshingly arbitrary diamond heist. No, Ocean’s 8 takes the true intrinsic (if unspoken) thrill of its genre to a logical extreme. Every exhibition of Awkwafina’s superhuman sleight of hand, every hint at Bullock and Cate Blanchett’s romantic past, every increasingly bulbous exotic cheroot puffed by a mainframe-hacking Rihanna—you’re all at once jazzed to bear witness and pained to live beyond reach of the lot. Though any heist picture worth its salt should manage to evoke just the right ratio of wish fulfillment and existential envy, Ocean’s 8 may be the first to found its very being on this mastery alone. (It is, at the very least, among the first to do so successfully.) The upholstery of panache takes such obvious precedent to the actual schematics of the heist that we’re expected not to mind when the odd chink in the armor is ironed out on the fly, or even when entire plot devices are upturned inscrutably in the name of another production in splendor. And tremendously, we don’t mind. By the time the film begins tossing asunder its own institutions in favor of whatever it has just realized would be even cooler, we’re already bought into the world it has built on the basis of such behavior: one so acutely aware of the 2018 beyond its borders that it truly has no place for sense, story, or the sentimental ideal of meaning whatsoever. Ocean’s 8 is painfully aware that rhyme and reason may be assets of a bygone era, and its only compensation is an indulgence in all the frivolity and flare it assumes we can stomach. That's what 2018 has to offer, after all, or so suggest the minds behind Debbie Ocean's high society flimflam. If the world at large no longer makes sense, why should anything have to? Why can’t we just tag along with Mindy Kaling and Helena Bonham Carter on an ad-hoc quest to defraud the staff of the Metropolitan Museum of Art for a few minutes? Why shouldn't we dive headfirst into a once-in-a-lifetime Anne Hathaway's every majestic tsunami of a line delivery? Why not expend everything we've always been told is supposed to matter in the name of the caliber of style, pizzazz, and unfiltered glee that only a multi-million-dollar jewel heist can buy? We may not be able to survive on it, but it's nice to try every once in a while. Jurassic World: Fallen Kingdom is a solid summer sci-fi!